Even on a "slow" day, NASA is a pretty cool place to work, but the cool factor gets cranked way up when the whole world joins in the adventure. That's what happened this week when the New Horizons spacecraft arrived at Pluto after decade-long, three-billion-mile journey through the solar system. New Horizons has already sent back never-before seen images of the dwarf planet, and is collecting so much data it will take 16 months to send it all back to Earth. - It's our biggest mission-related traffic event since we joined DAP in February 2013, with nearly 10 million page views on July 14th alone. During the 7 am hour, 42% of all government traffic was going to NASA pages. - NASA Television live streams were played more than 750,000 times during the day, with 200,000 plays during the arrival between 7 a.m. and 9 a.m. EDT. - On social media, #PlutoFlyBy trended #2 on Twitter Tuesday, an Instagram post of a Pluto image was liked 300,000 times (the most ever), and NASA gained another 200,000 Instagram followers. Even President Obama tweeted about the flyby. 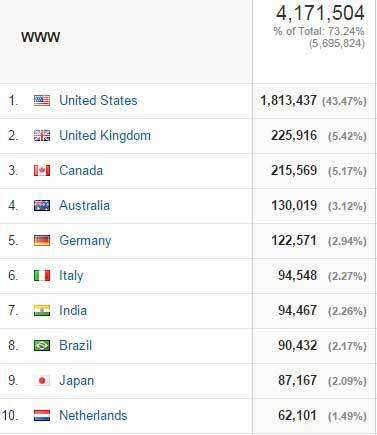 - This event had a huge global reach, with 57% of traffic coming from 231 different countries/territories outside the U.S. We hit pretty much every spot on the globe with a handful of exceptions. We're proud that we can show off this amazing milestone for America's space program to people all around the world. - More new users came to the site, and they stayed longer. New visits accounted for 64% of traffic, up from an average of 56%. Average session time was up to 4 minutes from an average of 2:25, but pages/session didn't change much, suggesting that users were spending more time on the site reading and looking at photos. The sheer volume of traffic also added to the engagement, with many users visiting older features while looking for the latest news. - NASA TV held its audience throughout the day, with plays in the 20-30,000 range even during hours with no direct New Horizons coverage. This was a bonus, giving us a larger than usual audience for broadcasts about the International Space Station and other NASA programs. This is just getting started. We're looking forward to seeing what else Pluto has to offer, and watching the analytics to see how the world engages.